On Wings of Eagles: Friendship and the Rhino. Across the grasslands of East Africa, live some of nature's most fascinating animals. The rhinoceros, a two-horned terror of tremendous speed, size and agility, is feared by most of the creatures in the wild. 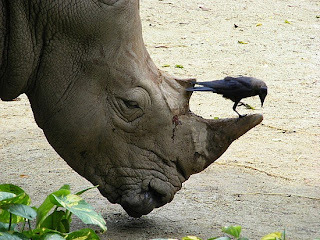 Being one of the most dangerous animals in the world, the rhino is avoided by most animals, that is, except the buffalo bird. Watching the rhinoceros in his natural habitat, you would see these birds perched on his back. From time to time, some would be pecking into his back much as a woodpecker would work away at an old tree. Others would be flying about the head of the rhino and still others lighting on his ears. The most amazing thing is that the rhino does not attack. This is so, for the two have an understanding. From birth, the rhino has poor eyesight. In addition, his body is covered with parasites which he cannot control. The flock of birds on his back do him a great service by eating these parasites, which are the whole of their diet. And, if there is any danger in the area, these birds let out a shrill call warning the rhino of what he cannot see. In return for this service, they are protected from their natural predators by one of Africa's largest mammals. In a real sense, these two totally different animals of the world kingdom are fulfilling the responsibilities of mutual friendship. Dear Lord we are thankful for our friends. We pray that we will be the encouragement that they need and that we will be there when they need to be lifted up. In Jesus' Name, Amen.